Look what I caught! My 1st fish for the year! This past weekend the weather here has been just beautiful! It is so nice to see the sunshine and the green grass. 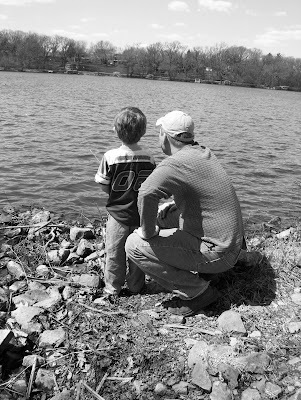 We went on a little fishing outing on Saturday. Our oldest wasn't feeling the best so he didn't come with. 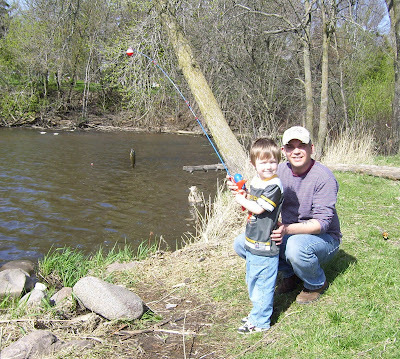 But our youngest was so excited, he has been practicing casting with his Spider Man fishing poll! He has gotten really good at casting and can get it out there! 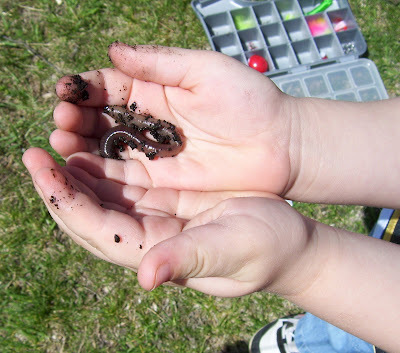 Also this year he's not afraid of the worms and even helped to get the worm on the hook. 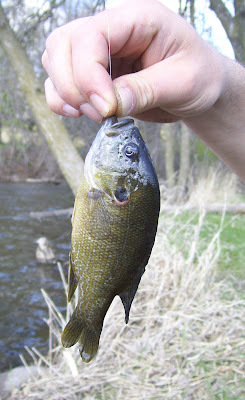 We only caught a couple of little pan fish and they were tiny-lol-as you can see in the picture! But Evan was so excited, he almost forgot what to do!! We went to a spot where I used to go with my Grandma and Grandpa when I was little. I was such a tom boy when I was little, didn't mind dirt a bit! I have many fond memories with my Grandma and Grandpa that I will always cherish. 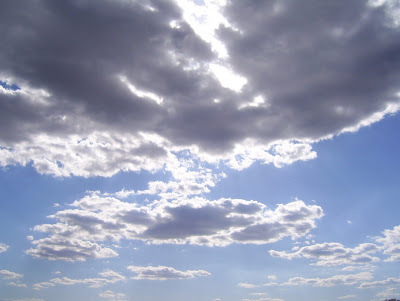 The sky was so picture perfect, with all the different shades of blue and the fluffy white clouds. I took a picture with my new camera and it turned out so beautiful I just had to share it! I hope you take a little time everyday to enjoy the beauty of nature. 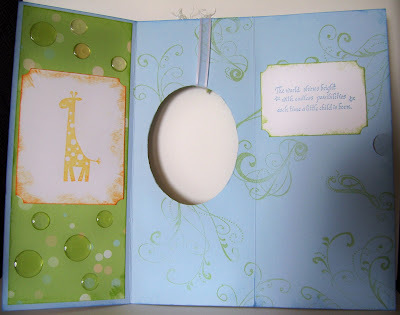 I seem to be making a lot of baby cards lately and I thought I would share three of my newest and favorite ones. 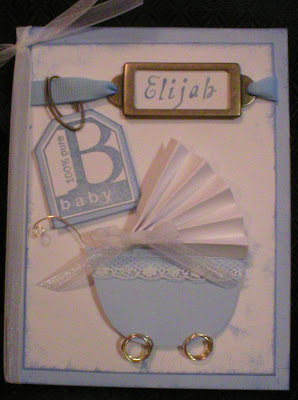 I think baby cards are so fun to make and it is especially fun when you can personalize them. The 1st card was for little Elijah. 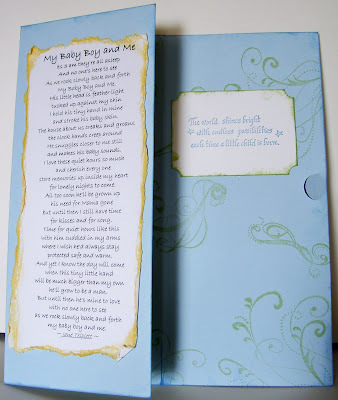 I have made a few of these cards with the buggy for girls and boys. I wanted something that was three dimensional so I came up with the idea to design a little buggy. Sorry about the picture quality, this was taken with my older camera. Almost everything used to design this card was SU products. The lace, ribbon and wire were from my stash. Also the stamps for his name are from CTMH. This 2nd card was for sweet little Keely. Elijah and Keely are cousins and there Grandam has shown me some of the cutest pictures of the two of them! 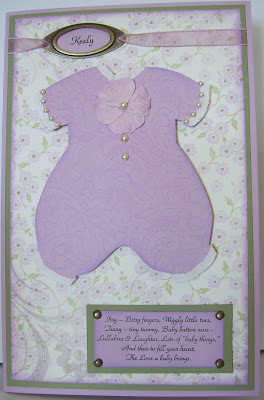 For this one I embellished a little onesie that I made and used SU Designer Series Double Sided PP. I used the Wild About You stamp set from SU. I love that set! I also used a stamp set from Autumn Leaves, called Swirls. The 1st picture is the view of the front of the card. The 2nd picture is the inside and I put a really neat poem there. I had found this poem a while back and I have been saving it for just the right card. Almost everyone who reads it says they get all teary eyed. The 3rd picture is when the card is opened all the way. This card is bigger than the one that was done in the tutorial but I think this card design could be made to fit any size card you would like. I embellished the card with a piece of chipboard, fibers and some clear dome sticker. To match the chipboard I mixed white acrylic paint with reinker. Here's the poem that was inside the card. Do you ever wish you could just have a little me time to do the fun things in life, the things you love? I know I sure do! It seems like there are never enough hours in the day. Most of my time gets devoted to family, which I don't mind at all. But when it comes to stamping so many times it seems like I am working on SU stuff or prepping for a class or doing orders for cards that I don't have the time to stamp just for fun and just for me. Last night I decided to take a little time just for me. I grabbed some CS, PP, stamps and some ink and went to town! I had no idea what I was going to come up. I played around with it all for a little while (stress free!) and then before I knew it I had the design in my head. It was so nice just to enjoy it and let all the creative juices flow. I'm very happy with the outcome! I just might have to make a few more of these to RAK out!! If you haven't done it in awhile I encourage you to take a little me time. Here is the card the I designed last night. 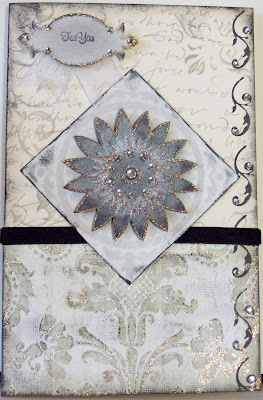 I used Very Vanilla CS, Pearl-ex, Stazon, Sahara Sand and Whisper White ink from SU. PP from the Old World Stack (Jo-Ann Fabrics). This is a list of stamps that I used--Making Memories (Floral/Dingbat), A Stamp in Hand (Script), SU (for you). 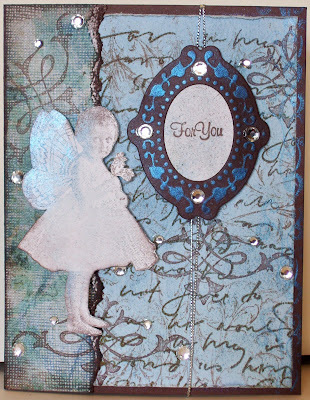 I also used some black velvet ribbon, stickles (Ranger), chipboard and gems to embellish the card. Let's give this another try! I know I left one post and then life happened and I haven't been back--bad blogger! This is going to be a fresh start and I promise to try and post every couple of days. Let's see if I can remember everything my good friend Dana told me about blogs *wink*. If not I might have to make a phone call. Eric and I just celebrated our five year anniversary. We have been together for eight years and married for five. I wonder where the time has gone... There have been so many changes in our lives the good and some not so good but always by far more good. The kids are getting older as are we. Dusty will soon be 14 and Evan is turning 5 this year! I can't believe it! One will be starting kindergarten and the other will be starting high school! Yikes!! Eric will be graduating in May. I am so proud of him!! He will be graduating with honors!! As for myself I am still having some medical issues but I always seem to stay busy with the family, friends and of coarse stamping. 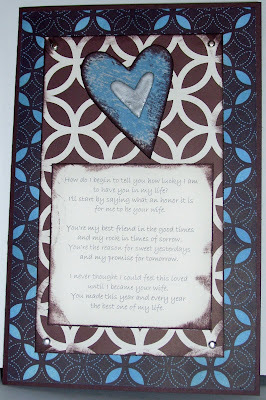 I am still doing Stampin' Up! and I am also doing classes here at our home. The weather is finally getting nice and I think spring is here to stay. Well I guess that will do for today, don't want to ramble on too much my first day back! lol! Here is a card that I made for Eric for our Anniversary. His favorite color is blue so a lot of times I try to add some blue to his cards. All of the paper is SU. I love the Au Chocolat PP that is in the Spring Mini Catty!! You can use classic ink and a brayer to change the color of the vanilla. That's what I did on the part of the card that is blue. Hope you all have a great day and I promise I will be posting more! !